OPEN Dalston has written to the Secretary of State appealing against a huge cut in family homes and an £11million cut in a developers contribution to affordable housing planned for Dalston. Hackney Council agreed to the cuts when it granted planning permission for developer, Hammerson's, Bishops Place scheme on 4.11.09. The government has the power to call in and overule the decision. The application is presently being considered by the Greater London Authority (GLA), which also has power to overule the decision. 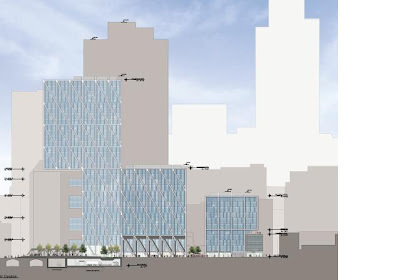 But Hackney reported that the GLA had already approved the £11million cut in affordable housing which was linked, Hackney said, to Hammerson's agreement to pay the GLA £3.1million towards the London Mayor's Crossrail scheme. 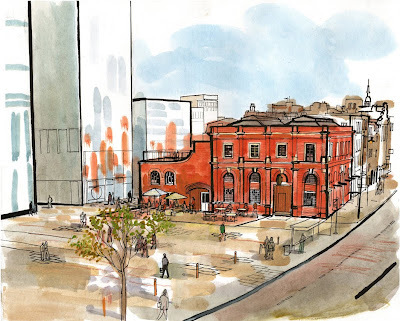 The design of Hammerson's scheme by Foster and Partners has been condemned as "fundamentally flawed" by the government's design advisers, CABE, but its objections were not seen by Hackney's Planning Committee. Desperate for cash Hackney Council owns most of the development site and stands to make tens of £millions under an option agreement to sell the site to Hammerson with the benefit of planning permission.The scheme first attracted controversy when Hackney recommended that its Planning Committee grant Hammerson permission to completely demolish The Light. The Light, an historic building at 233 Shoreditch High Street, which stands as a landmark on the border between the City and Shoreditch. Hackney have now approved the demolition of the rear part of the building. In the face of community opposition the Committee deferred its decision on 24.7.08. Hackney then had to include The Light in the Shoreditch Conservation Area when the Secretary of State and English Heritage intervened at OPEN Shoreditch's request. Normally they would not intervene unless it appeared that a local authority's decision was being influenced by a conflict of interest. The Slab above Transport for London's new station at Dalston Junction . The Slab has already had over £40million of public subsidy, and tower blocks of up to 20-storeys are to be built to pay for it - but there was no affordable housing planned at all. Hammerson's original planning application for Bishops Place included 100 family size flats and it also offered to make a contribution of £14million to "off-site" affordable housing which the Council said it would spend on The Slab development in Dalston. Hammerson amended its scheme which came back before Hackney's Planning Committee on 4.11.09. Hackney and the GLA usually look for up to 40% family homes on major schemes like this. But now Hammerson proposed to reduce the number of family homes from 100 to 33 (14%). Hammerson said there just wasn't enough open amenity space available to suit families. 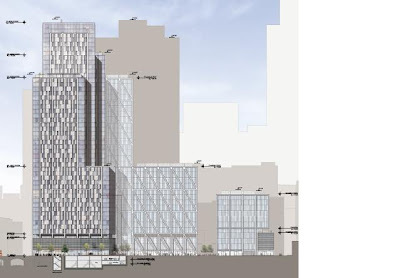 but Hammerson's planning application failed to include extensive neighbouring land which it owns, although its presentation to the Planning Committee showed that land also as developed . English Heritage objected to the Bishops Place scheme, criticising its "overbearing presence" and its "harmful impact on surrounding conservation areas and listed buildings". CABE said the scale of some buildings were "manifestly unsuited to their context"
And, although in August 2006 Hammerson had written to Hackney suggesting that 112 affordable flats (30%) on the site would be possible, it now proposed just 50, with only 11 for social rent. And it also dropped its contribution to "off site" affordable housing from £14million down to £3million because of market conditions. Hackney agreed to these cuts when granting planning permission on 4.11.09. However the Secretary of State has recently ruled, in a seperate case, that temporary economic difficulties do not justify abandoning affordable housing policies on major schemes. 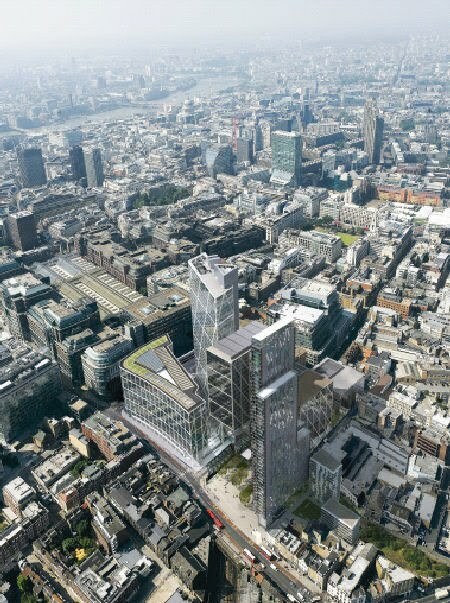 OPEN Shoreditch has complained to the Standards Board, which regulates local authorities' conduct, that Hackney had a prejudicial conflict of interest when it rushed the poorly designed scheme through. 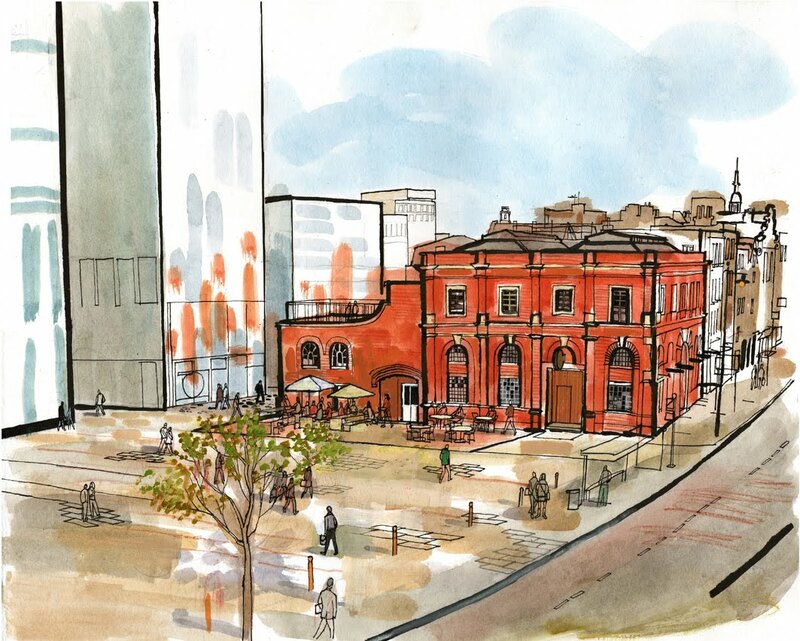 Hackney's report to its Planning Committee members highlighted that it owned the development site and that it had an option agreement to sell the site to Hammerson. But committee members were not also advised that the £millions the Council would get from the sale if granting permission was not a planning consideration and that they should not allow it to influence their decision. 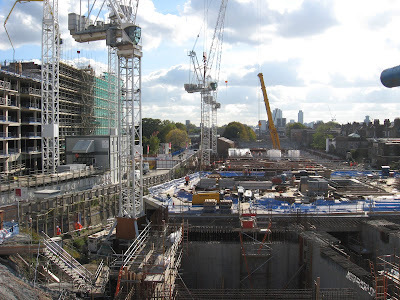 In 2007 Hackney earmarked the proceeds of sale from the development site to meet the costs of the new Town Hall annex which is now under construction. Soon people will be able to go these new offices to pay their Council tax. Meanwhile there are some 12,000 homeless and overcrowded applicants on the Council's housing waiting list and Hackney has described the shortage of family homes as "most acute". Authorities abandon affordable housing policies. 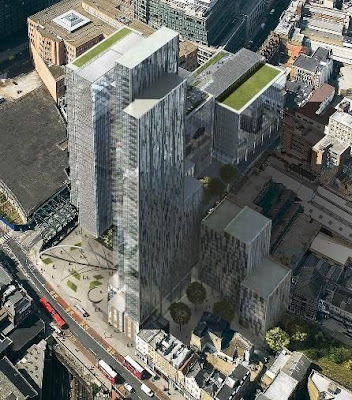 On 4th November Hackney Council agreed to give up an £11million payment intended for affordable housing in Dalston, when it granted planning permission for Hammerson's 52-storey Bishops Place tower block development in Shoreditch. In the face of community opposition Hackney had deferred the planning application in July 2008 and asked Hammerson to spare The Light at 233 Shoreditch High Street which was to be demolished. 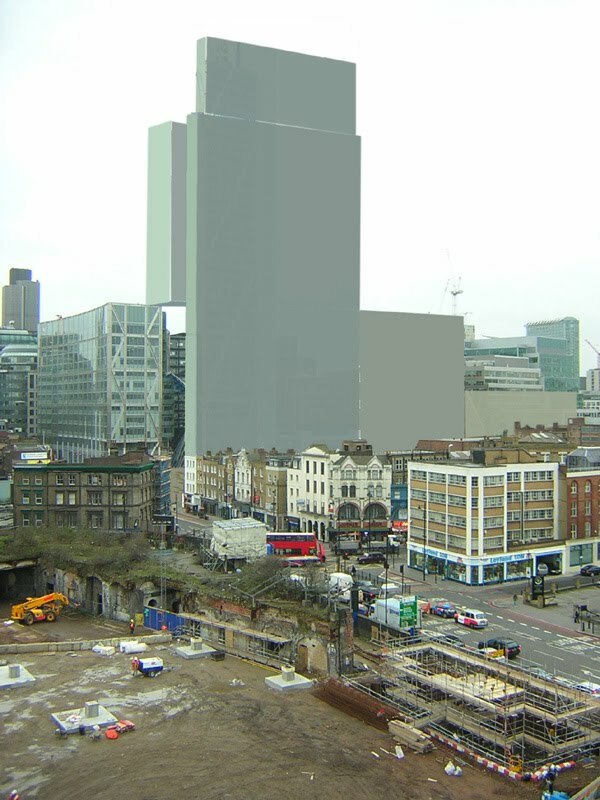 At that time Hammerson said there was room for only 50 affordable flats in its £400 million, 1.5 million sq ft., scheme. It offered to contribute £14 million to "off-site" affordable housing. The contribution was intended for TfL's Dalston Junction development, which has already received massive public subsidy, but where there is presently no affordable housing planned at all. 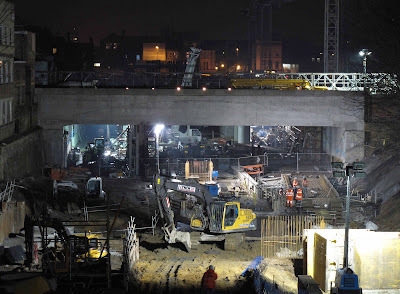 The Slab, a £40million concrete raft over the railway cutting, intended to provide a bus station and private flats in 8 blocks of up to 20 storeys at Dalston Junction. Hackney's, and the Mayor of London's, policy is that in larger schemes developers should seek to provide 50% affordable housing of which 70% should be for social rental and 30% for shared-ownership. Hammerson's mixed-use scheme includes 290 flats and serviced hotel apartments but there are to be only 11 flats (4%) for social rental. Hackney accepted that the international property developer, Hammerson, had been hit by the credit feeze , which meant that it could now only afford a £3million, and not a £14million, contribution to off-site affordable housing. But Hackney also extended the time to start the development to 5 years when it hopes that market conditions will have improved. The Bishops Place scheme, which still involves partial demolition of The Light, has been condemned by the Government's advisory commission, CABE, which objected to the "fundamentally flawed" design and the "canyon effect" of the blocks. But the rushed consultation process meant that CABE's objections were not made available for Planning Committee members to read. English Heritage advised that the "overbearing" development would have "a harmful impact on surrounding conservation areas and listed buildings". But English Heritage's letter was not on the planning file either. The Council did not even consult it's own Design Review Panel which has objected strongly to the previous designs. Hackney Council owns most of the Bishops Place site and will make £millions, under an option deal with the developer Hammerson, now the scheme has been granted planning permission. But the sale proceeds wont be spent on affordable housing or other community benefits in either Shoreditch or Dalston because they are earmarked to pay for Hackney's new annex to its Town Hall which, its Mayor hopes, will give Hackney citizens "a sense of civic pride". The Bishops Place scheme will now be reviewed by the Mayor of London's office. Hammerson has promised Mayor Boris £3.1 million to help pay for Crossrail and Hackney report that his office has already approved the affordable housing arrangements.